Dressing mixes are the versatile ingredients you can easily have on hand to keep chicken on the plate and diners asking for more. Are your customers growing tired of the same old chicken recipes? Liven up the menu with salad dressing mixes which help transform your usual chicken dish into something special. Dressing mixes are the versatile ingredients you can easily have on hand to keep chicken on the plate and diners asking for more. Wings are classic. Start your chicken adventures off on a tangy note by using Caesar Dressing Mix to make deliciously zesty Chipotle Caesar Wings. The garlic flavor in this recipe, coupled with a little chipotle pepper, is balanced out nicely with the cooler Caesar dressing base. Not sure what to do with plain grilled chicken breast? Sliced, grilled chicken breast served over a sensational summer dish like Strawberry Spinach Salad with Raspberry Vinaigrette can be just the topper for a lighter dish. Shredded radicchio, slivered almonds, wheatberries, spinach, and strawberries are among the ingredients that make this salad a favorite when drizzled with the summery Raspberry Vinaigrette. Another salad which is a crowd pleaser is Farm Stand Salad with Basil Pesto Vinaigrette. Add your grilled chicken topper to this salad which features fresh romaine lettuce, chunks of roma tomatoes, minced kalamata olives, artichoke hearts and shaved parmesan: It’s chicken reinvented! Let dressing mixes turn dips and spreads into a tasty partner for chicken strips or crispy chicken sandwiches. 1000 Island/Honey Mustard Dressing Mix turns “WOW” with this Wow Sauce recipe, bringing extra zip to your dishes. Add a specialty bun, such as ciabatta or brioche and turn a regular chicken sandwich into something extra special. Still want another dressing option for a dip or spread? Wow Sauce becomes Super WOW Sauce by adding horseradish to the mix. The horseradish flavor adds a distinctive touch that becomes the star of your chicken sandwich. As spicy flavors have become more prevalent, consumers’ preference for these options has also increased, particularly for sauces and dips. Don’t worry if you can’t decide which dressing to make! For a fun twist on chicken fingers, add multiple sides of dressings on the side for a dipping extravaganza and patron customization. Keep the heat dialed up when you take Ranch Dressing Mix up a notch. Offer condiments at different spice levels to cater to consumers’ varying preferences. Try Chipotle Ranch for something a bit more calm and smoky, Jalapeno Cilantro Ranch for those more adventurous, and Mango Habanero Ranch for those who want to go all out. Wrap up your chicken menu with an Avocado Ranch Dressing which is perfect for a healthy wrap, perhaps made with other summer favorites like spinach, spring lettuces, and crunchy iceberg. Avocados and lime juice complement a grilled chicken filling-simple and delicious! For bacon lovers, try a Bacon Ranch Dressing to match up the wonderful flavors of ranch, chicken, and bacon all in one wrap. With dressing mixes, your ideas become an easy-to-make reality and chicken is “in” again. 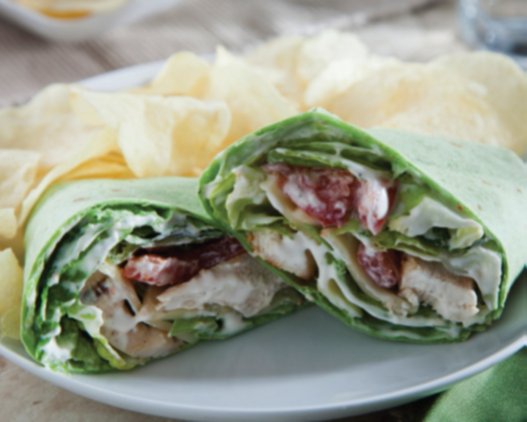 Wraps are a summer favorite! For all of these recipes and more, visit foothillfarms.com/recipes. With more than 80 dressing recipes online, Foothill Farms® offers operators unique salad dressing, sandwich spread and dipping sauce inspiration to satisfy patron cravings while allowing operators to make top dressing menu claims including—freshly made, signature and house. Think of everything that tastes better with Ranch Dressing? Wings, salad, wraps, sandwiches, raw veggies, pizza…The applications are endless. Expand dressing variety to Caesar, Blue Cheese, Italian, Honey Mustard and 1000 Island and you can envision the possibilities! With more than 80 dressing recipes online, Foothill Farms® offers operators unique salad dressing, sandwich spread and dipping sauce inspiration to satisfy patron cravings while allowing operators to make top dressing menu claims including—freshly made, signature and house. Recently, Foothill Farms tapped into Pinterest, a popular social media site known for showing off unique ideas, beautiful photography and culinary creations. With over 20 boards and 280 pins, the recipe collection is vast and designed to help chefs find taste-tested recipes quickly and easily with just a couple clicks of the mouse. Just added are recipes using Foothill Farms 1000 Island / Honey Mustard Dressing Mix #V405. Find recipes for Wow Sauce, Super Wow Sauce and Asian Dressing on the Dressings board. Most Foothill Farms® salad dressing dry mixes are designed to be mixed with buttermilk and mayonnaise. If a chef doesn’t want to use this ingredient, no fretting necessary! Our dry mixes are versatile and can also be mixed with a combination of sour cream, mayonnaise and water without compromising flavor. Another non-existing compromise is shelf and refrigerated storage space. Dry mix is known for allowing operators to only mix what they need when they need it. The expiration date on the dry mix packaging is 12 months. We’re slightly biased but we would love to hear your feedback on our dry mixes. Please let us know your culinary experiences with dry salad dressing mix. Feel good making your dressings from “speed scratch”. It’s Time to Dress It Up For Business: Is Your Salad Ready? New research shows that opening the door to the thriving soup and salad market can bring in additional sales. Technomic, a leading research group for the foodservice industry, found that 43% of consumers chose a certain restaurant based on their salad options alone. It is important for us in the foodservice industry to recognize these emerging trends so that we stay informed and offer what today’s consumer is demanding. Fast casual restaurants, the fastest growing segment of the restaurant industry, have profited from offering “Signature Salads”. Salads encompassing exotic lettuces, meat or seafood toppings, nuts and berries, and a wide variety of cheeses suggest higher-quality ingredients; giving off the aura of nutritious and satisfying. Another key part of the emerging demand for salad is for the flavorful dressings that compliment them. Dressings are no longer relegated to “on the side” but instead have become the cornerstone of a salad. Ethnic offerings entice tired palates to try an alternative twist to a safe favorite. For example, Foothill Farms® Avocado Ranch Dressing elevates the ever-popular ranch to a more complex, gourmet offering. This dressing compliments the Mexi-Cali Cobb Signature Salad, a blend of fresh baby spinach leaves, black beans, grilled shrimp, and pureed avocado. A second signature salad utilizing Ranch Dressing as a base is the popular Asian Salad. Our Wasabi Ranch Dressing gives romaine lettuce, grilled or smoked chicken, cilantro, wonton strips, purple cabbage, and sesame a spicy kick (another trend for 2014)! If peppery makes you cautious, chefs use our 1000 Island or Honey Mustard Dressing mix to create an Asian Dressing that gives taste buds a sweeter, honey-ginger fix. Another “Signature Salad” that pleases the less adventurous eater while still encouraging the desire to branch out is a steak, ham, or bacon topped salad. These salads draw guests looking for lower carb options but who aren’t ready to sacrifice the “meat” on their plate. Foothill Farms® Blue Cheese Dressing drizzled atop mixed herbs, roasted red peppers, provolone cheese, red onions, seedless cucumbers, and sliced cherry tomatoes, adds just the right amount of hearty and tangy to satisfy the inner lumberjack. Last but certainly not least, especially with the growing trend of vegan and organic-demanding consumers, is the vegetarian garden salad. Fresh from the farm rules the day when salads offer a variety of lettuces, herbs, peppers, mushrooms, berries, fruits, onions, and squash. Our Lido Italian Dressing & Seasoning mix allows you to create your own “Signature Dressing” by adding your choice of vinegars – wine, balsamic, or white. If your goal is green (no pun intended), adding “Signature Salads” to your menu is a sure way to tempt your patrons’ taste buds and keep them coming back for more! Using dry salad dressing mixes like Foothill Farms®, allows foodservice professionals to create multiple varieties of gourmet. For more salad recipe ideas, please visit http://www.foothillfarms.com/recipes. Author Foothill FarmsPosted on April 14, 2014 April 8, 2014 Categories dressing mixes, dry mix, Flavorwise™, Foodservice, foodservice trends, Foothill Farms, healthful menu, Kent Precision Foods Group, menu choices, menu ideas, recipe, restaurant trends, salad dressings, signature saladTags asian salad, avocado ranch, blue cheese dressing, ethnic cuisine, fast casual, foodservice, Foothill Farms, garden salad, honey mustard dressing, Kent Precision Foods Group, Lido Italian, menu trend, mexi-cali cobb, organic, ranch dressing, recipe, research, restaurant industry, restaurant trend, salad, salad dressing, signature salad, steak salad, Technomic, thousand island dressing, vegan, vegetarian, wasabi ranchLeave a comment on It’s Time to Dress It Up For Business: Is Your Salad Ready?